I am going to admit something to you real quick, I HATE the Easter Bunny. I know, I know I know . . . send me to the stocks! It wasn't a big deal at my house growing up. My parents didn't put a lot of emphasis on the mythical-overgrown cottontail. Maybe that is part of the reason that I loath the lore. I guess the whole Santa thing is okay for me since I feel like he has a spiritual tie to the day, but the bunny? I mean spring, with all of it's newness is so symbolic of the resurrection of Christ. Yet the bunny itself, just isn't to me. With that said, Easter is probably my favorite holiday. First off, I suffer from Seasonal Affect Disorder pretty hard. February is ALWAYS the darkest time for me. I honestly can say that I barely function that month. I have said it a thousand times, and I will say it again, God made February the shortest month of the year out of sheer mercy towards me. So sorry for any of you that love it! So spring is such a welcome relief to me! I literally spend the first part of spring in tears of gratitude every time I see the sun shining. I feel the transformation of spring in my soul, along with feeling it on my skin. I love the message of spring, it will all be okay. Even through the death of the trees, flowers, bushes, it all comes back. Even the darkest times of our lives will get better. The sun will shine again tomorrow! (Or at least sometime in March.) It is so symbolic of the triumph of Easter. Christ triumphed death! We will live again, even after we die! That is such an amazing promise to anyone that has lost a loved one. So how do you get your kids excited about celebrating the real meaning of Easter when the commercialism of the holiday is all around you? (No for reals, that isn't a rhetorical question.) I think my kids get excited about things that they talk about. If we never stepped foot inside of a Walmart, would my kids even know that Easter was on it's way? YES!! Well first of all, Easter is on Max's birthday this year, so he has been talking about Easter for a while now. But second is that these two weeks leading up to Easter, we are talking everyday about what it REALLY means. We are memorizing John 14:15 currently. This week we are also telling a "story of Jesus" every day. I am telling some of the highlights of his ministry and life on the earth. I can't believe all of the learning that comes along with it! Yesterday we talked about when Christ was found in the temple teaching the teachers. 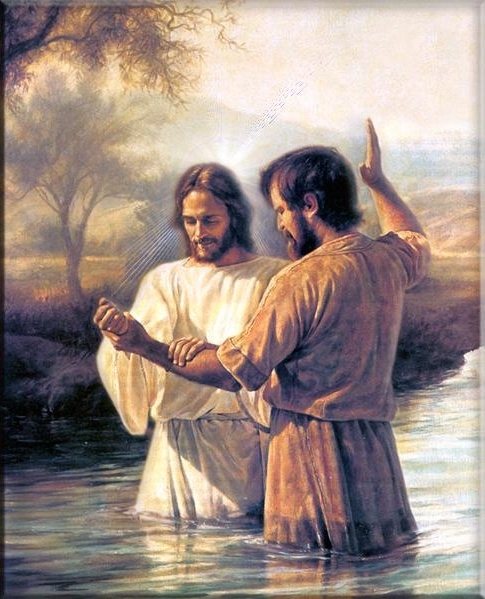 Today we talked about his baptism. It was so fun to talk about why we are baptized and even why making covenants with our Father in Heaven is important. We will be talking about Christ walking on water, feeding the 5,000, blessing the children, and healing the sick. Next week we will be memorizing John 3:16, and everyday will will discuss what happened to Jesus on those last days of his life. I think by doing this, whatever little secular traditions we happen to humor won't be as big of a deal. I do happen to love some new Easter clothes!! Young Tiffany gives me some advice. It won't cost much . . . Just your voice!